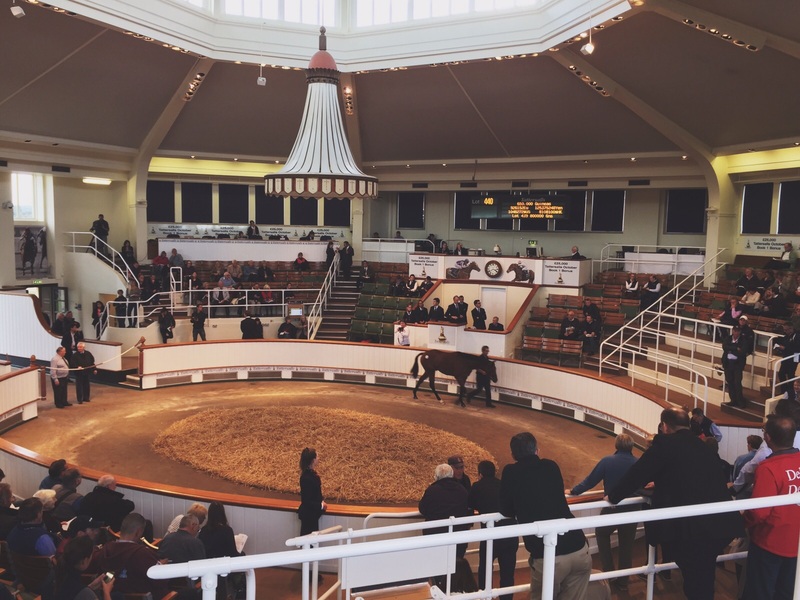 One of the busiest times of year in the racing industry is once again upon us with the Yearling Sales at Tattersalls in full flow. We are already on Day 3 of the Book 1 sale which offers a selection of some of the most incredibly well bred and good looking horses anywhere in the world and, at the time of writing, the Bedford House team had already secured six very exciting horses. Due to recent events we find ourselves in a position where we have to be brave and buy horses without necessarily having an owner for them. In the spirit of “moving forward” we purchased Lot 50 for 82,000gns. He is an attractive grey colt by the successful second season sire, Dream Ahead, out of the Listed Stakes winning mare America Nova. He comes from a very good family and is the brother to top class Australian performer Sir Patrick Moore and the Group 3/Listed winner Stellar Path. We are also very fortunate to have his half-brother, War Story, a two year old by Myboycharlie already in training with us. Being a Book 1 purchase, he is eligible for the new £25,000 Tattersalls October Book 1 Bonus Scheme which means that his new owner(s) will receive the above sum should he win a Class 2, 3 or 4 Maiden as a two year old. Shares are available for purchase so please do not hesitate to contact our office if you would like to inquire about him. As mentioned previously, we are extremely touched by the continued support from our current owners. Mr Jon Kelly has been a firm supporter of Bedford House since 2010 and he is the proud owner of a number of horses including Beautiful Morning (winner of the Convivial Stakes) and Mizzou (winner of the Group 3 Longine Sagaro Stakes). He is also a great supporter of the English and Irish bloodstock industry especially the Tattersalls Yearling Book 1 Sale. This year he has, once again, made the trip from the US and was able to secure two very attractive, well-bred horses on the first day. The first, Lot 60, is a beautiful daughter of Teofilo, the sire responsible for dual Group 1 winning filly Pleascach, out of a mare that has produced a number of black type runners. The second purchase, Lot 91, came a little later in the day as, a colt by top sire Dubawi, went unsold in the ring. We have been lucky to train quite a few of his progeny over the years and, of course, two of our best horses this year, Postponed and Lady of Dubai, are also by him. The colt looks incredibly similar to how Postponed did as a yearling so hopefully this will prove to be a good omen for the future. We are also very pleased to say that Lot 314, a striking daughter of Nathaniel, was knocked down to another of our owners, Dahab Racing, at the end of Day 2. Nathaniel was an exceptional racehorse and, from what we have seen at the sales so far, he has all the right credentials to become an equally successful sire. This filly is the first of his progeny to join our team and we are thoroughly looking forward to seeing what she can achieve on the racecourse. Our very own Fittocks Stud has also enjoyed a rather productive sale so far with, at the time of writing, the hammer going down on two of the three lots to go through the ring and we would like to take this opportunity to wish their new connections the very best of luck. The excitement started right at the beginning of Day 1 when the Invincible Spirit colt out of Wallis was knocked down to John and Jake Warren on behalf of Al Shaqab Racing for 310,000gns. On Day 2 there was another good result when Lady Of Dubai’s full sister (Dubawi x Lady Of Everest) stepped into the ring and was purchased by John Ferguson for 420,000gns. The third, a half-sister to our very promising two year old Haggle, sadly did not reach her reserve, however, we love the family and believe that this filly could go on to great things so we decided to retain her and hopefully she will prove us right in the future. Mr Stuart Stuckey has been an incredible supporter of our team by not only having horses in training with us but also by having his mares at Fittocks Stud. This year was the first time that Mr Stuckey has had horses in the prestigious Book 1 so none of us could contain our emotions when lot 112 was sold for 470,000gns. She was the only filly in the sale by Dansili out of the Montjeu mare, Cascata, which makes her a half-sister to Richard of Yorke. Not only is she an incredibly beautiful filly but she also comes from a top class family as her dam is a full sister to St Nicholas Abbey. We trained the dam and her first two offsprings so we know the family well and wish the new owners the very best of luck. Another of Mr Stuckey’s was Lot 133, a colt by Pivotal, who also did not reach his reserve and therefore went unsold. However, we are incredibly pleased that he is to join our team next year as we also trained his dam, Contredanse, to win the Italian Oaks and he is also another exciting prospect for the future.